At the seder meal of Passover, it is traditional to set the table with glasses for wine (or grape juice). An extra glass is always placed on the table and filled, and at a certain point after the dinner the door is opened for a minute or two so that the Prophet Elijah may enter if he wishes. Many Jewish families have an elaborate Elijah cup. We've used a plastic wine glass (from a party store or supermarket) and some stick-on gems to make ours. Older children might want to write "Elijah" on the cup with permanent markers too. 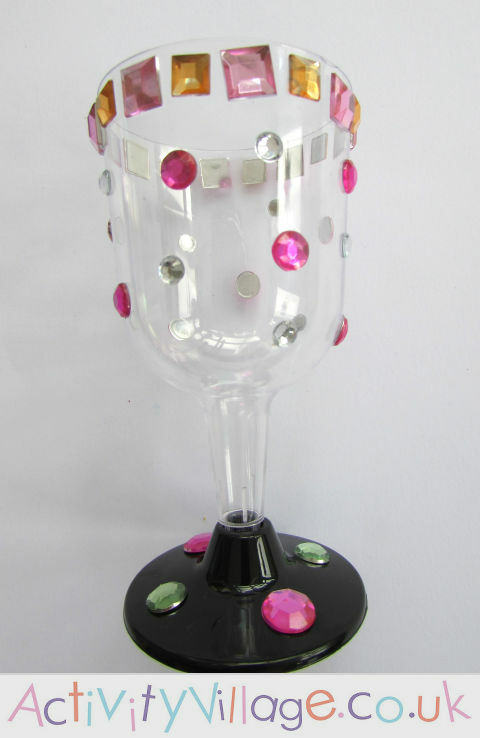 Simply decorate your goblet with sticky gems and optional permanent pens. With younger children you might want to give the permanent pens a miss! This Passover sensory poem is written from the author's point of view and describes what the author is seeing, smelling, feeling, tasting and hearing during Passover. A great way to inspire some poetry writing! What goes on a seder plate and why? Children can write about what they have learned and then colour in the picture too using our seder plate story paper. Children can use our seder meal story paper to write about their own family seder meal at Passover, or perhaps to describe what happens and what each part of the meal represents. And of course there is a picture to colour in too.